Eurocom is currently shipping the fastest Haswell based 4th gen Intel Core i7 powered notebook with dual NVIDIA GeForce GTX 780M graphics. 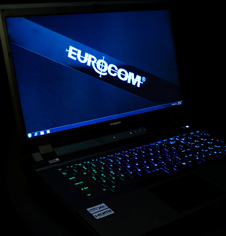 The EUROCOM Scorpius 2.0 is a ultra high performance, VGA upgradeable laptop computer designed to offer the utmost in performance and capability. The Scorpius 2.0 is a fully customizable and upgradeable 17.3” Laptop with the newest and best available components to offer our customers the absolute best in no compromise performance. Featuring dual graphics technology including dual NVIDIA GeForce GTX 780M graphics cards offer EUROCOM Scorpius 2.0 users up to 8 GB DDR5 video memory, 3072 CUDA cores, 256 TMUs and 64 ROPs. The addition of the NVIDIA GeForce GTX 780M, the highest performance mobile solution from NVIDIA, gives Eurocom customers a superior choice of graphics processor to configure into their new Scorpius, which already consists of AMD Radeon, NVIDIA GeForce and NVIDIA Quadro graphics to give Eurocom customers the exact graphics configuration to fit their specific application. Up to 32GB of DDR3 1600 memory is also supported via four sockets. With such massive amounts of RAM available, the Scorpius becomes a great tool for high performance computing. In the EUROCOM Scorpius 2.0, up to 5 storage drives are offered, including two mSATA SSD drives. The Scorpius 2.0 has many connectivity options to allow users to connect the system to external displays for gaming for video streaming including: HDMI 1.4a, S/PDIF, Thunderbolt. 4 USB 3.0 ports, an eSATA, USB 2.0 combo port are also offered. The thunderbolt port is a revolutionary new interface technology that supports both high resolution displays and high throughput storage devices, allowing for a new level of flexibility and ease of use. The EUROCOM Scorpius comes with an illuminated backlit full size keyboard with numeric keypad. The backlit keyboard helps to increase usability in dim lighting conditions, to ensure operators can see the keyboard in nearly any environment.